When researchers ran computer simulations to study vibrations, they noticed that some of the polymers didn’t behave as expected. If they tweaked the starting parameters, the system evolved normally up to a point, but then it diverged into a patterned series of vibrations that were not random. The simulated polymer becomes thermally superconductive — that is, capable of transporting heat with no resistance, much like the existing class of superconducting materials that conduct electricity without resistance. A researcher at Georgia Institute of Technology has applied for a National Science Foundation grant to create an educational app that would catalog a unique musical signature for each element in the periodic table so that scientists would have a new tool to use in identifying the differences between the molecular structures of solids, liquids and gases. Asegun Henry, Director of the Atomistic Simulation & Energy (ASE) Research Group, and an Assistant Professor in the George W. Woodruff School of Mechanical Engineering, is also in the process of setting all of the elements in the table to music. However, when Henry and Lv ran their computer simulations, they noticed that some of the polymers they were modeling didn’t behave as expected, Ouellette reports. If they tweaked the starting parameters a bit, the system evolved normally up to a point, but then it diverged into a patterned series of vibrations that were not random. The simulated polymer becomes thermally superconductive — that is, capable of transporting heat with no resistance, much like the existing class of superconducting materials that conduct electricity without resistance (albeit at very low temperatures). Henry and Lv successfully identified three vibrational modes out of several thousand responsible for the phenomenon. However, traditional analysis techniques — like plotting the amplitudes of the modes over time in a visual graph — didn’t reveal anything significant. It wasn’t until the researchers decided to sonify the data that they pinpointed what was going on. This involved mapping pitch, timbre and amplitude onto the data to translate it into a kind of molecular music. The three modes faded in and out over time and eventually synchronized, creating a kind of sonic feedback loop until the simulated material became thermally superconductive. “As soon as you play it, your ears pick up on it immediately,” said Henry. So, it’s solid proof-of-principle of sonification as an analytical tool for materials science. For many decades, phonon transport at interfaces has been interpreted in terms of phonons impinging on an interface and subsequently transmitting a certain fraction of their energy into the other material. It has also been largely assumed that when one joins two bulk materials,interfacialphonon transport can be described in terms of the modes that exist in each material separately. However, a new formalism for calculating the modal contributions to thermal interface conductance with full inclusion of anharmonicity has been recently developed, which now offers a means for checking the validity of this assumption. Here, we examine the assumption of using the bulk materials’ modes to describe the interfacial transport. The results indicate that when two materials are joined, a new set of vibrational modes are required to correctly describe the transport. As the modes are analyzed, certain classifications emerge and some of the most important modes are localized at the interface and can exhibit large conductance contributions that cannot be explained by the current physical picture based on transmission probability. Today I visited North Star Imaging and Instron companies for their Open House in Irvine, California. I believe this is the first in California. Knowing some of their products very well I realized, after professional presentations and live demos that these machines can help Californian industry, Department of Homeland Security, as well as the research in many aspects of it, from nondestructive evaluation of key industrial products, medical devices inspections, aeronautic composites, as well as new applications in actual research such as Laser Metal Printing, Mechanical Engineering, bio-implants, etc. I found very interesting the presentation on imaging a 3D Printed object with an internal complex topology. For the quality of their pictures, cross sections and resolution I congratulate the team that put these breakthroughs together. The picture below is an X5000 x-ray machine capable of producing high quality computed tomography pictures (CT) of various objects from many domains of industry and research. The famous STL files for 3D printing are produced here in a X5000 machine. A definition of STL file is given here. The STL (STereoLithography) is a file format native to the stereolithography CAD software created by 3D Systems. STL has several after-the-fact backronyms such as “Standard Triangle Language” and “Standard Tessellation Language”. This file format is supported by many other software packages; it is widely used for rapid prototyping, 3D printing and computer-aided manufacturing. STL files describe only the surface geometry of a three-dimensional object without any representation of color, texture or other common CAD model attributes. The STL format specifies both ASCII and binary representations. Binary files are more common, since they are more compact. An STL file describes a raw unstructured triangulated surface by the unit normal and vertices (ordered by the right-hand rule) of the triangles using a three-dimensional Cartesian coordinate system. STL coordinates must be positive numbers, there is no scale information, and the units are arbitrary. Once the 3D object is scanned, the STL file can be downloaded to the 3D printer machine and a copy of the original can be produced. For people working on Medical 3D Printing this machine is extremely useful. According with the information released, link in here, Instron, headquartered in Massachusetts, USA, is a global market leader in the materials testing industry. It manufactures and services a comprehensive range of materials testing equipment and accessories for the research, industrial and academic sectors. A variety of Instron systems test samples ranging from components for jet engines to medical syringes. Instron has just launched an advanced bi-axial variant of the ElectroPuls E3000 All-Electric test instrument. The E3000 is a compact table-top instrument comprising: a load frame, crosshead with combined linear/torsion actuator, Dynacell load cell and T-slot table for fixing samples. 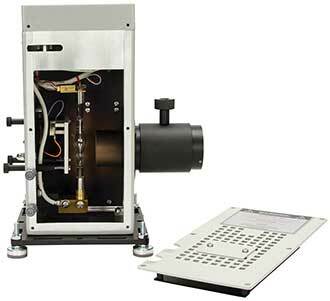 The state-of-the-art ElectroPuls series includes the E1000, E3000 and E10000 fatigue test systems. These are suited for biomedical / biomechanical research applications and feature a wide dynamic performance range and low force characteristics. ElectroPuls is all-electric and utilises linear motor technology, which eliminates the need for ball / lead-screws and enables slow-speed static tests through to high-frequency dynamic tests at over 100 Hz. The new E3000 linear-torsion is a smaller-scale equivalent of the E10000 linear-torsion system and includes a rotation axis with a standard range of ±135° as well as optional multi-turn capability for applications such as orthopaedic bone-screw testing. An ElectroPuls bi-axial linear-torsion test can be conducted on most materials and has found applications in testing inter-vertebral disc prostheses, various bio-materials, athletic footwear and elastomeric components. The Open House of the two companies, NSI and Instron, was very well organized and it was a great success for Californian industry, Academia, Medical testing, and Research. As we know the electrodes, n particular the anodes, for Li-ion batteries are highly studied today hoping to improve the specific power, A*h/g, as well as the cycle time and the number of charge discharge cycles. Researcher at USC Los Angeles California studied the effect of porosity of electrodes, see link here in order to improve Li-ion battery characteristics. The researchers used porous Si nanoparticles anode to increase A*h/g. Their study, link in here, shows an improvement of the capacity of the Li-ion battery. Other researchers adopted the approach of using natural carbon porous materials such as pollen. Pollens, the bane of allergy sufferers, could represent a boon for battery makers: Recent research has suggested their potential use as anodes in lithium-ion batteries, see link in here. The picture below, taken from the link in here, shows a scanning electron microscope image of a bee pollen studied for potential use as electrodes for lithium-ion batteries. Color was added to the original black-and-white image in order to better differentiate details on each pollen sphere, in which I see a great resemblance with cancer cells! The credit for the picture goes to Purdue University / Jialiang Tang. It is interesting that the authors comments are in many cases useful on better understanding the trends in the future development of Li-ion batteries. As they state, link in here/ they were looking for a carbon distribution with a given porosity and topography architecture. “Our findings have demonstrated that renewable pollens could produce carbon architectures for anode applications in energy storage devices,” said Vilas Pol, an associate professor in the School of Chemical Engineering and the School of Materials Engineering at Purdue University. Batteries have two electrodes, called an anode and a cathode. The anodes in most of today’s lithium-ion batteries are made of graphite. Lithium ions are contained in a liquid called an electrolyte, and these ions are stored in the anode during recharging. The researchers tested bee pollen- and cattail pollen-derived carbons as anodes. Research findings are detailed in a paper that appeared on Feb. 5 in Nature’s Scientific Reports, see link in here. Whereas bee pollen is a mixture of different pollen types collected by honey bees, the cattail pollens all have the same shape. The researchers processed the pollen under high temperatures in a chamber containing argon gas using a procedure called pyrolysis, yielding pure carbon in the original shape of the pollen particles. They were further processed, or “activated,” by heating at lower temperature – about 300 degrees Celsius – in the presence of oxygen, forming pores in the carbon structures to increase their energy-storage capacity. The research showed the pollen anodes could be charged at various rates. While charging for 10 hours resulted in a full charge, charging them for only one hour resulted in more than half of a full charge, Pol said. “The theoretical capacity of graphite is 372 milliamp hours per gram, and we achieved 200 milliamp hours after one hour of charging,” he said. The researchers tested the carbon at 25 degrees Celsius and 50 degrees Celsius to simulate a range of climates. “This is because the weather-based degradation of batteries is totally different in New Mexico compared to Indiana,” Pol said. Findings showed the cattail pollens performed better than bee pollen. The work is ongoing. Whereas the current work studied the pollen in only anodes, future research will include work to study them in a full-cell battery with a commercial cathode. Electron microscopy studies were performed at the Birck Nanotechnology Center in Purdue’s Discovery Park. The work was supported by Purdue’s School of Chemical Engineering. The electron microscopy studies at Birck were funded by a Kirk exploratory research grant and were conducted by doctoral students Arthur D. Dysart and Vinodkumar Etacheri. An XPS measurement was conducted by Dmitry Zemlyanov at Birck. Other support came from the Hoosier Heavy Hybrid Center of Excellence (H3CoE) fellowship, funded by U.S. Department of Energy. The conversion of allergic pollen grains into carbon microstructures was carried out through a facile, one-step, solid-state pyrolysis process in an inert atmosphere. The as-prepared carbonaceous particles were further air activated at 300 °C and then evaluated as lithium ion battery anodes at room (25 °C) and elevated (50 °C) temperatures. The distinct morphologies of bee pollens and cattail pollens are resembled on the final architecture of produced carbons. Scanning Electron Microscopy images shows that activated bee pollen carbon (ABP) is comprised of spiky, brain-like, and tiny spheres; while activated cattail pollen carbon (ACP) resembles deflated spheres. Structural analysis through X-ray diffraction and Raman spectroscopy confirmed their amorphous nature. X-ray photoelectron spectroscopy analysis of ABP and ACP confirmed that both samples contain high levels of oxygen and small amount of nitrogen contents. At C/10 rate, slow charging rate in 10 hours, ACP electrode delivered high specific lithium storage reversible capacities (590 mAh/g at 50 °C and 382 mAh/g at 25 °C) and also exhibited excellent high rate capabilities. Through electrochemical impedance spectroscopy studies, improved performance of ACP is attributed to its lower charge transfer resistance than ABP. Current studies demonstrate that morphologically distinct renewable pollens could produce carbon architectures for anode applications in energy storage devices. The novel biosensor developed by scientists at Rice University in collaboration with colleagues in Thailand and Ireland may make the detection of pathogens much faster and easier for food-manufacturing plants, see link in here . The picture below taken from, see link here, shows an array of sensitive cantilevers that are functionalized with a specific antibody or peptide that binds to a pathogen that we believe is in the food we like to inspect. A general working principle for cantilevers is shown in here, where a bimorph piezoelectric materials, the sensor, with four electrodes deposited in an asymmetric position on the two parallel sides of a cantilever produce an electric signal once the tip is bended or is under a small weight or force. Other micro-cantilevers use different sensors to maximize the sensitivity. If the pathogen binds specifically to a deposited antibody or peptide on a sensitive cantilever, the free tip of the cantilever will deflect down under the weight of the pathogen. The deflection down of the micro-cantilever can be associated with a reflected laser beam deviation on a position sensitive detector that outputs an electrical signal that can be further processed. In this way, we know what specific pathogen is binding to a known micro-cantilever, so that we can identify the pathogen and from the strength of the signal, the amplitude of the deviation, we may be able to say how much or what concentration of the pathogen is in the food. A laser version of the electronic micro-cantilever exists, see link in here. The picture below shows an array of seven micro-cantilever that binds to seven different pathogens due to the fact that each micro-cantilever has different active antibody or peptide specific to bind on a pathogen. Figure below shows construction details of one cantilever used by the authors of the paper published, link in here. The yellow color designates the Gold layer deposited on a Si substrate. This Au/Si micro-cantilever shown do not use a sensor attached to it because it may cause a poor sensitivity to small amounts of pathogens detected. A study on this research appears online this month in the American Chemical Society journal Analytical Chemistry, see link in here. The process appears to easily outperform tests that are now standard in the food industry. The standard tests are slow because it can take days to culture colonies of salmonella bacteria as proof, or laborious because of the need to prepare samples for DNA-based testing. The Rice process delivers results within minutes from a platform that can be cleaned and reused. The technology can be easily customized to detect any type of bacteria and to detect different strains of the same bacterium. The “diving boards” are a set of microcantilevers, each of which can be decorated with different peptides that have unique binding affinities to strains of the salmonella bacteria. When a peptide catches a bacterium, the cantilever bends over so slightly, due to a mismatch in surface stress on the top and bottom. A fine laser trained on the mechanism catches that motion and triggers the alarm. The system is sensitive enough to warn of the presence of a single pathogen, according to the researchers, who wrote that very low pathogen concentrations cause foodborne disease. From the article published on line, see link in here, we can envision the direction and the applications of the research in the future. The idea springs from research into the use of microcantilevers by Rice biomolecular engineer Sibani Lisa Biswal and lead author Jinghui Wang, a graduate student in her lab. Biswal was prompted to have a look at novel peptides by her graduate school friend, Nitsara Karoonuthaisiri, head of the microarray laboratory at the National Center for Genetic Engineering and Biotechnology in Thailand. Karoonuthaisiri is also a visiting scientist at the Institute for Global Food Security at the Queen’s University, Belfast. Karoonuthaisiri and her team had isolated bacteriophage viruses associated with salmonella through biopanning and phage display, a technique to study interactions among proteins, peptides and pathogens. She then derived peptides from the phages that would serve as targets for specific bacteria. “She said, ‘We spend a lot of time trying to characterize which of these peptides work the best. It looks like you have a platform that can do and quantitate that.’ So that’s where we came in,” Biswal said. The Rice lab compared the peptides’ performance with commercial antibodies now used for salmonella detection and found the peptides were not only more sensitive but could be used in a multiplexed cantilever array to detect many different kinds of salmonella at once. “The peptides are very robust,” Biswal said. “That’s why a lot of people like them over antibodies. The peptides can handle harsher conditions and are much more stable. Antibodies are large proteins and break down more readily. “We’re very excited to see where this will lead,” she said. If the peptide adherence on the cantilever is strong, as the authors suggest, then different microcantilever made of Quartz can be used, knowing that extremely small amounts of pathogen bonded will change the frequency of the microcantilever.In this case the calibration curve is frequency versus weight. Common goals of spectroscopy applications such as studying the chemical or biological properties of a material often dictate the requirements of the measurement system’s lamp, power supply and monochromator. Many common spectroscopic measurements require the coordinated operation of a detection instrument and light source, as well as data acquisition and processing. Integration of individual components can be challenging and various applications may have different requirements. Conventional lamp-based tunable light sources are a popular choice for applications requiring a measurement system with this degree of capability. Many types of tunable light sources are available, with differences in individual component performance translating to the performance of the system as a whole. Tunable light sources are finding themselves to be an especially ideal system for one application in particular: quantum efficiency and spectral responsivity characterization of photonic sensors, such as solar cells. Xenon and mercury xenon lamps, two examples of DC arc lamps. The tunable light source’s (TLS) versatility as both a broadband and high-resolution monochromatic light source makes the unit suitable for a variety of applications, such as the study of wavelength-dependent chemical or biological properties or wavelength-induced physical changes of materials. These light sources can also be used in color analysis and reflectivity measurements of materials for quality purposes. Among their unique attributes, the TLS can produce monochromatic light from the UV to near-infrared (NIR). 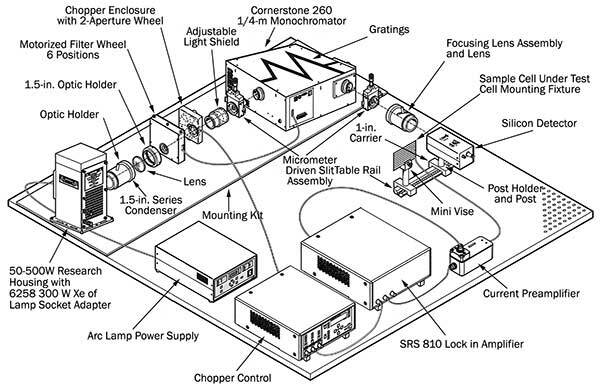 Lamp-based TLSs feature two major components: a light source and a monochromator. Common lamps used in TLSs are the DC arc lamp and quartz tungsten halogen (QTH) lamp. While both of these lamps have a broad emission spectrum, arc and QTH lamps differ in the characteristic wavelength emissions or relatively smooth shape of their spectral output curves, respectively. A stable power supply for the lamp is a critical component since most applications require high light output power stability1. DC arc lamps are excellent sources of continuous wave, broadband light. 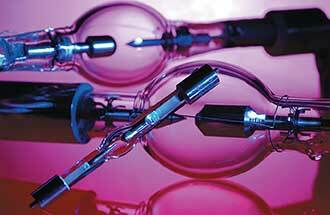 They consist of two electrodes (an anode and a cathode) separated by a gas such as neon, argon, mercury or xenon. Light is generated by ionizing the gas between the electrodes. The bright broadband emission from this short arc between the anode and cathode makes these lamps high-intensity point sources, capable of being collimated with the proper lens configuration. Figure 1. A xenon arc lamp housed in an Oriel Research lamp housing. Photo courtesy of Newport Corp.
Xenon (Xe) arc lamps, in particular, have a relatively smooth emission curve in the UV to visible spectrums, with characteristic wavelengths emitted from 380 to 750 nm. However, strong xenon peaks are emitted between 750 to 1000 nm. • Ozone-free: Wavelength emissions below about 260 nm create toxic ozone. Ideally, an arc lamp is operated outdoors or in a room with adequate ventilation to protect the user from the ozone created. • UV-enhanced: For applications requiring additional UV light intensity, UV-enhanced lamps should be used. These lamps provide the same visible to NIR performance of an arc lamp while providing high-intensity UV output due to changes in the material of the lamp’s glass envelope. • High-stability: High-stability arc lamps are made of a higher quality cathode than that typically used for arc lamp construction. As a result, no arc wander occurs, allowing the lamp to maintain consistent output intensity throughout its lifetime. Figure 2. The spectral output of 3000-W Xe and 250-W QTH lamps used in Oriel’s Tunable Light Sources.Photo courtesy of Newport Corp.
QTH lamps produce light by heating a filament wire with an electric current. The hot filament wire is surrounded by a vacuum or inert gas to prevent oxidation. QTH lamps are not very efficient at converting electricity to light, but they offer very accurate color reproduction due to their continuous blackbody spectrum. These lamps are a popular alternative to arc lamps due to their higher output intensity stability and lack of intense UV light emission, spectral emission lines in their output curve and toxic ozone production. These advantages over traditional DC arc lamps make QTH lamps preferable for radiometric and photometric applications as well as excitation sources of visible to NIR light. QTH lamps are also easier to handle and install, and produce a smooth output spectrum. Selecting the most appropriate lamp type is a matter of deciding which performance criteria are most important. The power supply is a vital component for operating a DC arc or QTH lamp with minimum light ripple. The lamps are operated in either constant current or constant power mode and are used in applications such as radiometric measurements, where a stable light output is required for accurate measurement. Providing stable electrical power to the lamp is important since fluctuations in the wavelength and output intensity of the light source impact the accuracy of measurement. There is very little difference in the short-term output stability when operating an arc lamp or QTH lamp in constant current or constant power mode. However, the differences appear as the lamp ages. For arc lamps, even with a stable power supply, deposits on the inside of the lamp envelope are visible as the electrodes degrade, which causes an unstable arc position, changing the electrical characteristics of the arc lamp. The distance between the cathode and anode of the arc lamp increases, raising the lamp’s operating voltage. For QTH lamps, deposits on the inside of the lamp envelope are visible as the lamp filament degrades, changing the electrical and spectral characteristics of the lamp. In power mode, the lamp is operated at a constant power setting. As the voltage cannot be changed, the current is raised or lowered to maintain the power at the same level. As the lamp ages, the radiant output decreases. However, lamp lifetime is prolonged. In current mode, the lamp is operated at a constant current setting. As the voltage cannot be changed, the power is raised or lowered to maintain the current at the same level. As the lamp ages, the input power required for operation is increased. This results in greater output power, which, to some extent, may help compensate for a darkening lamp envelope. However, the lamp’s lifetime is greatly reduced due to the increase in power. Figure 3. Oriel’s OPS Series Power Supplies offer the option of operating a lamp in constant power, constant current or intensity operation modes. Photo courtesy of Newport Corp.
Monochromators use diffraction gratings to spatially isolate and select a narrow band of wavelengths from a wider wavelength emitting light source. They are a valuable piece of equipment because they can be used to create quasi-monochromatic light and also take high precision spectral measurements. A high precision stepper motor is typically used to select the desired wavelength and switch between diffraction gratings quickly, without sacrificing instrument performance. Determining which slit width to use is based on the trade-off between light throughput and the resolution required for measurement. A larger slit width allows for more light throughput. However, more light throughput results in poorer resolution. When choosing a slit width at which to operate the monochromator, both the input and output ports must be set to the same slit width. (See Figure 4.) Focused light enters the monochromator through the entrance slit, and is redirected by the collimating mirror toward the grating. The grating directs the light toward the focusing mirror, which then redirects the chosen wavelength toward the exit slit. At the exit slits, quasi-monochromatic light is emitted4. Figure 4. A fixed width slit being installed into an Oriel Cornerstone 130 monochromator.Photo courtesy of Newport Corp. Measuring quantum efficiency (QE) over a range of different wavelengths to measure a device’s QE at each photon energy level is an ideal task for a tunable light source. The QE of a photoelectric material for photons with energy below the band gap is zero. The QE value of a light-sensing device such as a solar cell indicates the amount of current that the cell will produce when irradiated by photons of a particular wavelength. The principle of QE measurement is to count the proportion of carriers extracted from the material’s valence band to the number of photons impinging on the surface. To do this, it is necessary to shine a calibrated, tunable light on the cell, while simultaneously measuring the output current. The key to accurate measurement of the QE/internal photon to current efficiency is to accurately know how much scanning light is incident on the device under test and how much current is generated. Thus, measurement of light output with a NIST (National Institute of Standards and Technology) traceable calibrated detector is necessary prior to testing since illumination of an absolute optical power is required. External quantum efficiency (EQE) is the ratio of the number of photons incident on a solar cell to the number of generated charge carriers. Internal quantum efficiency (IQE) also considers the internal efficiency — that is, the losses associated with the photons absorbed by nonactive layers of the cell. By comparison, EQE is much more straightforward to measure, and gives a direct parameter of how much output current will be contributed to the output circuit per incident photon at a given wavelength. IQE is a more in-depth parameter, taking into account the photoelectric efficiency of all composite layers of a material. In an IQE measurement, these losses from nonactive layers of the material are measured in order to calculate a net quantum efficiency — a much truer efficiency measurement. Understanding the conversion efficiency as a function of the wavelength of light impingent on the cell makes QE measurement critical for materials research and solar cell design. With this data, the solar cell composition and topography can be modified to optimize conversion over the broadest possible range of wavelengths. As a formula, it is given by IQE = EQE/(1 − R), where R is the reflectivity, direct and diffuse, of the solar cell. The IQE is an indication of the capacity of the active layers of the solar cell to make good use of the absorbed photons. It is always higher than the EQE, but should never exceed 100 percent, with the exception of multiple-exciton generation. Figure 5 illustrates how the tunable light source is used to illuminate the solar cell to perform an IQE measurement. The software controls all components of the measurement system, including the monochromator and data acquisition5. Figure 5. A sample QE measurement system using the components of a tunable light source. Photo courtesy of Newport Corp.
To measure quantum efficiency in 10-nm wavelength steps, the slit size of the monochromator is typically hundreds of micron in width. The slit width is reduced approximately half if 5-nm wavelength increments are desired. 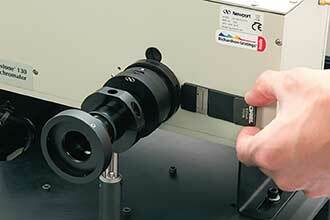 However, output power of the monochromator is reduced by more than 50 percent if the slit width is halved. Lowering optical power impacts QE measurement since a solar cell responds to this diminished optical power with low output current. This can result in a poor signal-to-noise ratio, making a QE measurement error more likely. The detection of low current requires very sensitive equipment with the ability to measure current down to the pico-ampere level. To make for an easier signal measurement, optical power is typically increased. A DC arc source is the better choice for QE measurements made in 5-nm increments or lower due to the lamp’s arc size resulting in better monochromator throughput. However, a QTH lamp is the better choice if greater than 0.1 percent light stability is required, with the trade-off of not being able to measure in as precise wavelength increments as if an arc lamp was used. Balance between optical power and resolution is an important consideration as it impacts the quality of the QE measurement. The selection of lamp type and monochromator specifications are important considerations for TLS design. To be considered a suitable component for the majority of spectroscopic applications, high-output power and stability, long lifetime of the lamp, and broadband spectral emission with high resolution capability are required for the TLS. John Park, new product development manager at Newport Corp., has designed and developed numerous spectroscopy instruments for the photonics industry for over 10 years. He holds two granted patents and is a graduate from University of California, Irvine, with a Ph.D. in electrical engineering; email: john.park@newport.com. Jeff Eng is a product specialist for Oriel Spectroscopy Products at Newport Corp. His work experience includes application support, business-to-business sales and marketing activity of photonic light sources and detectors. He is a graduate of Rutgers University; email: jeff.eng@newport.com. 1. Newport Corp., Oriel Instruments TLS datasheet. Tunable Xe arch lamp sources.http://assets.newport.com/webDocuments-EN/images/39191.pdf. 2. Newport Corp., Oriel Instruments handbook: The Book of Photon Tools, light source section. 3. Newport Corp., Oriel Instruments OPS datasheet. OPS-A series arc lamp power supplies.http://assets.newport.com/webDocuments-EN/images/OPS-A%20Series%20Power%20Supply%20Datasheet.pdf. 4. J. M. Lerner and A. Thevenon (1988). The Optics of Spectroscopy. Edison, N.J.: Optical Systems/Instruments SA Inc.
5. K. Emery (2005). Handbook of Photovoltaic Science and Engineering, eds. A. Luque and S. Hegedus. Chapter 16: Measurement and characterization of solar cells and modules. Hoboken, N.J.: John Wiley & Sons Ltd. Many physicists remember the general relativity classes and the Einstein equations, see link in here, whose solution gives us the wave vector and the wavelength. More on this topic can be found in here. A famous physicist, Serban Titeica, said on his classes, link in here, that a theory is good if it is supported by experiment, otherwise is null. Since the ripples of a gravitational perturbation were recently proved experimentally, see link in here, we are thinking like Titeica, asking ourselves, what is the benefit of General Relativity. Some business people will ask for how much profit they can get, of course they talk about monetary profit. The others, it depends were in the social field they work, will say the gravitational waves detected is a great result for education, for humanity knowledge, and for intellectual enlightenment. In a public discussion, see the video link, a participant said the benefits are in the new technology that can be transferred to the industry. Now we cannot forget the benefits from space exploration by NASA that brought innovative solutions to many industries including computers and communications. The picture below taken from the previous video,. shows the essence of actual activity on gravitation research. On the lower right corner of the picture is the LIGO, Laser Interferometer Gravitational-Wave Observatory, which is a Michelson type of interferometer with two perpendicular arms, each having a length of about 4 Km. Two gravitational interferometers are operating on two different locations on US, one in Livingston, Louisiana State, the other in Hanford, Washington State. Both stations detected same signal with same characteristics. and 2nd video from Caltech, California. Stephen Hawking, a well known author and scientist on Time and Gravitation Theory and Black Holes, congratulated LIGO team, watch video at this link in here. Regarding the applications in medicine, I think all physical fields, including gravitation, have an influence on our life, on all living cells. It is well established that the electric field has a major effect on living cells, since all processes in the living cells are based on electric charge transfer from one molecule to another in a complex collective material interaction. Other physical fields, like electromagnetic fields have many applications in medicine starting with RF therapeutics, laser, and optical communication. We can include here NASA’s research tremendous contribution on non-medical industries and new technologies, but this in another posting. Now, not only the physicists can enjoy the knowledge about recent results on gravitation, but also the engineers and anybody who is interested on the philosophy of the universe asking themselves what is the answer to crucial questions like why we live in this Universe, how the Universes influence us, etc. Researchers have always thought that flat, ultrathin optical lenses for cameras or other devices were impossible because of the way all the colors of light must bend through them. Consequently, photographers have had to put up with more cumbersome and heavier curved lenses. But University of Utah electrical and computer engineering professor Rajesh Menon and his team have developed a new method of creating optics that are flat and thin yet can still perform the function of bending light to a single point, the basic step in producing an image. His findings were published Friday, Feb. 12, in a new paper, “Chromatic-Aberration-Corrected Diffractive Lenses for Ultra-Broadband Focusing,” in the current issue of Scientific Reports. The study was co-authored by University of Utah doctoral students Peng Wang and Nabil Mohammad. In order to capture a photographic image in a camera or for your eyes to focus on an image through eyeglasses, the different colors of light must pass through the lenses and converge to a point on the camera sensor or on the eye’s retina. How light bends through curved lenses is based on the centuries-old concept known as refraction, a principle that is similar to when you put a pencil in a glass of water and notice that it “bends” in the water. To do this, cameras typically will use a stack of multiple curved lenses in order to focus all of the colors of light to a single point. Multiple lenses are needed because different colors bend differently, and they are designed to ensure that all colors come to the same focus. Menon and his team discovered a way to design a flat lens that can be 10 times thinner than the width of a human hair or millions of times thinner than a camera lens today. They do it through a principle known as diffraction in which light interacts with microstructures in the lens and bends. Menon’s researchers use specially created algorithms to calculate the geometry of a lens so different colors can pass through it and focus to a single point. The resulting lens, called a “super-achromatic lens,” can be made of any transparent material such as glass or plastic. Other applications of this potential lens system include medical devices in which thinner and lighter endoscopes can peer into the human body. It also could be used for drones or satellites with lighter cameras in which reducing weight is critical. Future smartphones could come with high-powered cameras that don’t require the lens jetting out from the phone’s thin body, such as the lens does now for the iPhone 6S.